Today is Frederic Bastiat’s 214th birthday. Over at Carpe Diem, Mark Perry has a great tribute to the man by listing some of his best quotes and his works. Frederic Bastiat is a huge influence on me. I’d be lying if I said anything else. He’s a brilliant and concise writer, with enough humor and sarcasm to remain entertaining. I highly recommend any of his writings, but none more so than That Which is Seen and That Which is Unseen. You will be better off for reading it. Why Doesn’t Minimum Wage Cause Noticeable Job Loss? Standard economic theory predicts that a price floor, such as minimum wage, would cause a relative surplus in the good: too few of the good is demanded and too much supplied. The logic is that minimum wage would likely cause layoffs (or higher unemployment) then would occur outside of the price controls. And yet, for all the theorizing, whenever minimum wage is raised, the negative consequences are usually negligible (or, sometimes, non-existent). Why is this? To the economically uninformed, this would suggest there are no consequences to hiking the wage. To the economically-informed, there are a preponderance of explanations, ranging from monopsony power, to rearranging compensation, to attrition. Allow me to humbly offer one more explanation. Here is a chart of your standard price floor analysis. The biggest thing to take away here is that the minimum wage is set above the equilibrium wage. That is what causes the disemployment effects: a wage set higher than what most workers typically get. But, what if the price floor is set below the equilibrium? In that case, the wage floor would appear to have no effect, but that is simply because it is set too low. I propose this is why minimum wage appears to have no/negligible effects on employment. You’ll notice that, for these industries, the average wage of their non-supervisory employees (meaning managers, execs are excluded) are all above the national minimum wage. This would suggest that even a minimum wage of $10 or $11/hr would still result in very little disemployment effects! Of course, those who are working below such a minimum would still be harmed, (let us not forget that the above is an average) but it may help explain why so many studies find such little disemployment effects on minimum wage. Value is, always and everywhere, a subjective determination. Nothing has intrinsic value. A dollar, for example, only has value in that one can find someone else willing to trade for it. If no one is willing to trade for it, it is valueless. An example of this occurs in Mass Effect 3. One of the side quests of the game involves Commander Shepard acquiring high end weapons for C-Sec (Citadel Security, the police force of the Citadel). C-Sec had originally contacted a black-market weapons dealer for the weapons. When negotiating payment, C-Sec offered Credits (the galactic currency) and the dealer refused. Commander Shepard is asked to work out a bargain. In conversations with the dealer, he says he’s refusing credits because, following the war with the Reapers, the credits will be useless. He is looking for something more physical. Regardless of the right- or wrong- headedness of the dealer’s proposition, he did not value the galactic credits in the same way as Commander Shepard and C-Sec did. Although Shepard and C-Sec attached high value to the currency, the dealer did not. No trade would progress until the Commander was able to find something the dealer valued (in this case, artifacts). Astute readers will notice a lot of overlap between this post and the preceding one. That is because this concept is built into trade, but it is such an important concept I thought it deserved its own post, especially as many laymen tend to think things have intrinsic value, especially commodities like gold, oil, etc. Things only have value insofar as they are useful. One of the side quests the player (Commander Shepard) can undertake is Mass Effect 3 is one that demonstrates the old idea that trade only occurs if both parties agree. During Mass Effect 3 (remember, galaxy in chaos, massive invasion), Commander Shepard becomes aware that a refugee group has a large supply of military-grade medication, exactly what one needs to fight and win a galactic war. Commander Shepard goes to the refugee leader to discuss acquiring the medication and offers up his surplus of food, exactly what one needs to feed a refugee camp. Initially, the refugee leader refuses the bargain, trying to get more out of the Commander. However, when Commander Shepard goes to walk away from the deal, the refugee leader backs down and agrees to the original exchange. The refugees get their much-needed food and the military gets their much-needed medication. Both parties here had an excess of goods and were able to trade it for supplies they needed/valued more. Both parties were made better off after the trade than before because both parties could now consume more. The galaxy was made a little better, a little wealthier. These sort of bargains go on all the time in real life, to the point they are so common no one notices. I’m a huge sci-fi nerd. I’m also a huge fan of the Mass Effect series. As I near the completion of my fifth play-through of the trilogy, there are a number of economic lessons taught in the series. To tease these lessons out, I’m starting a new series of posts on this blog. I will do my best to avoid spoilers, but I cannot guarantee anything. If you’re hoping to avoid spoilers, I’d suggest holding off on reading this until you play the game (but seriously, the series is eight years old at this point. Where have you been?). I hope you’ll enjoy this as much as I do writing it. Profiteering, or the art of charging higher prices during a natural disaster or war, is treated as a dirty thing. In fact, many states and countries have made it illegal. Unfortunately, the myth that profiteers are nothing more than greedy individuals trying to capitalize on distress is very common. In Mass Effect 3, this pops up right near the beginning of the game. Some background: the galaxy is invaded by a super powerful race of sentient machine-organic hybrids known as the Reapers. All major civilizations (Humans, Turians, Asari, and Salarians) are under attack. Within hours of the invasion, the Human government is dead, Earth is under attack, galactic communications are in disarray (meaning inter-planetary trade is very difficult to conduct), and normal travel lanes are raided by mercenaries and the Reapers. Early on in the game, the player (Commander Shepard) is on the Citadel (the home of the galactic capital) and he runs into an old friend, Dr. Chole Michel. While discussing the situation on the Citadel, Dr. Michel notes that “war profiteering has already begun,” making it hard for the hospital to get the medication it needs. Commander Shepard just shakes his head in disbelief. Undoubtedly, the price of medication has risen for the hospital, but does that mean it is due to greediness? Hardly. Re-read my second paragraph: the galaxy is in chaos. Supply chains are disrupted. A war is on. Demand is high and supply is low. A simple supply-demand analysis would suggest prices will rise. Traders and manufacturers are incurring extra risks and need to protect shipments from raiders. Manufacturers have longer supply chains, increasing their costs. Raw material miners need to travel further and further to get their inputs. All these things raise the price of goods. The higher prices also encourage substitutes and technological advances, such as ways to make the current supply of medication more effective (in fact, this is a side quest the player can undertake). In addition, consumes of the medication will look for alternatives as well, and those who value the medication for less than the market price can sell their stocks (this example also appears in-game and we will discuss it in a future post). Far from profiteering being a drag, it is actually a good thing when resources are exceptionally scarce. If the Council (the ruling body of the Citadel) were to enact legislation against profiteering , this would have a detrimental effect on the supply of goods; prices will be unable to rise, and there will be less incentive for manufacturers to produce, less incentive for consumers to ration, and under-supply will continue to be a problem. The primary way of “thinking like an economist” is thinking on the margin. What this means is analyzing how things change with the addition of one extra unit (One extra machine increases productivity by how much and costs by how much, for example). This method of analysis helps us to learn about how resources are allocated and help individuals maximize their profits (or, as economists define it, where marginal revenue equals marginal costs). This is unlike many sciences. In some, if a variable is small enough, it can be ignored. The good economist does not do this. The good economist thinks on the margin and takes that small variable into account. This is why I get upset when people claim the costs of minimum wage are small (or negligible), so the wage increase should be enacted. Such an argument is uneconomic. Overall, the effect may be small, but for those trapped on the margin, those whom the wage increase does have a cost, for them the cost is not small. If one only focuses on the big picture and ignores the margins, one runs the risks of misallocating resources. The speaker confuses cause and effect. He makes a simple mistake, as Scott Sumner puts it: reasoning from a price change. You see, Mr. Hanahuer looks at high wages, sees low unemployment and (incorrectly) concludes that the high wages cause low unemployment. 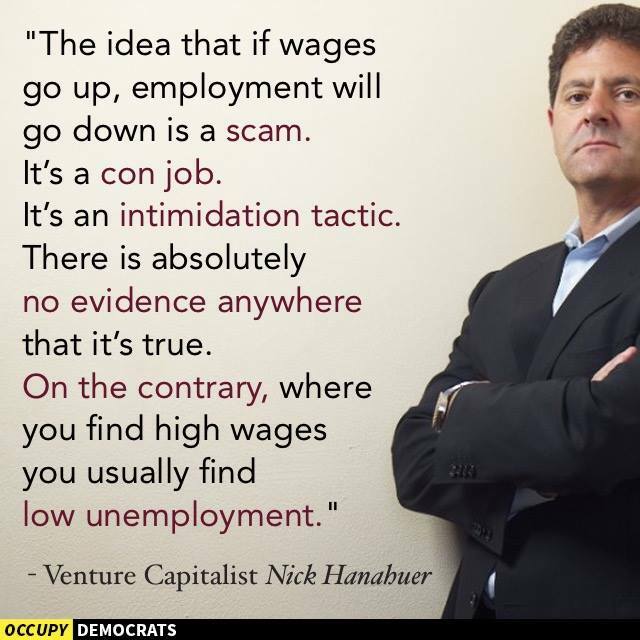 In actuality, it is the other way around: low unemployment cause high wages. When a good/service is relatively scarce (in this case, labor), it means the price (wages) for the good will rise. Likewise, if demand is high, so will be prices. John Maynard Keynes noted this. It’s one of the reasons he suggests recessions can take a while to recover from and government is necessary: wages are “sticky” he says, which prevents them from falling during a recession to allow for the now glut of workers. Since wages are too high, businesses don’t hire, perpetuating the problem. That is why Keynes calls for government spending and hiring: to stimulate demand that is too low for prices. I guess there is a second lesson here too: not all businessmen understand economics.